343 milioane USD a platit grupul german Axel Spinger pentru a prelua 88% din actiunile BusinessInsider.com ceea ce inseamna o evaluare de ~ 450 milioane USD. Nemtii mai detineau 9% ceea ce inseamna ca au ajuns la 97%, diferenta de 3% fiind in posesia lui Jeff Bezos. O combinatie interesanta. Axel Springer e prezent indirect in Romania prin parteneriatul cu Ringier (de fapt e un joint venture in Europa de Est, Romania fiind singura tara in care nemtii nu au intrat inca). There's no money in news/content. Except for Buzzfeed, Business Insider, Medium, Reddit, Financial Times, Vice, Vox Media, etc. 1. Medium.com, platforma lansata de Ev Williams (ex Twitter, ex Blogger) acum 3 ani, a fost evaluata la 400 milioane dolari de o investitie a celor de la Andreessen Horowitz. Link. 2. Google anunta ca va lansa targetarea pe baza adresei de email, lucru pe care Facebook il face deja din 2012. Link. To break into the top 10 brands would imply a production volume of at least 2.5 million units (about the same as Daimler ships today.) At 2.65 million and a price of $55k/vehicle Apple’s revenues from cars would total about $145 billion. This is roughly the sales value of the iPhone business today. Not bad. Maybe that would satisfy a financial analyst. 4. 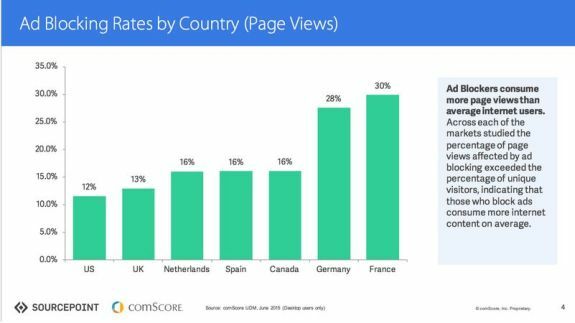 Finally, publishers must take control of their site experiences, and turn down advertising that doesn’t meet their standards for user engagement. 2. Google si Facebook care dau pretul in jos –> publisherii sunt obligati sa compenseze scaderea pretului cu formate agresive care genereaza clickuri, adica volume. 3. Programmaticul care niveleaza oferta si reduce publisherii mari la nivelul pietei. If you see how stock analysts value Google and Apple stocks, around 90% of the value of Apple ($650bn) is due to iOS while around 8% of the value of Google ($450bn) is due to Android. And this is the case even though outside the US Android has 82% market share. But while Android has 81% smartphone market share Apple with less than 14% has over 80% of the global smartphone market profits. This happens because if you are a $650bn company focused on one product you are likely to beat a $450bn multiproduct company. And then there is the other vulnerability of Google which is ads. Search related ads are around 80% of the value of Google. 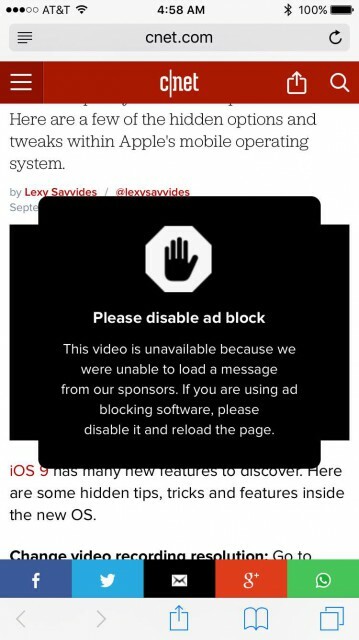 Ads are to Google what iOS is to Apple. But in ads Google is under attack from another company: Facebook. Facebook is a $260bn ads only company that does not allow Google to crawl it. For Google everything that goes on at Facebook, Instagram, Whatsapp is a black hole. But Facebook has found another way to make ads work that is not search based but instead it is contextual to whatever you are doing on Facebook. And these ads are extremely well targeted. Facebook allows advertisers to use key demographics such as geography, gender, age, income, occupation, something that Google cannot do. 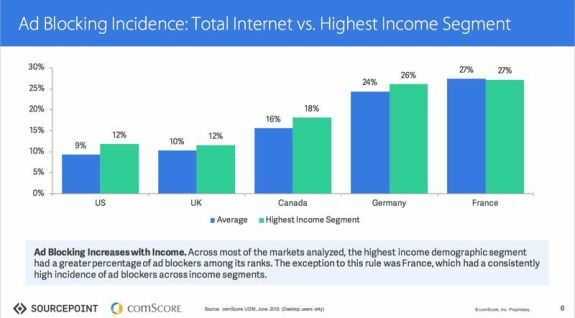 Moreover Facebook is way ahead of Google in mobile advertising and the fight against ad blockers. 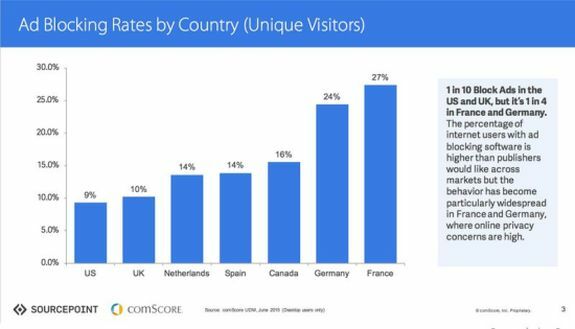 De data asta de la Comscore, adica standardul in materie de masurari web in SUA si nu numai, si Sourcepoint. Intregul studiu va fi disponibil in aceasta toamna, oricum cele 4 slideuri sunt suficiente pentru a confirma ce aflasem deja din precedentul raport. Situatia pe tari, la nivel de unici, deja in Germania si Franta s-a ajuns la 24% respectiv 27% din total populatie utilizatoare de internet! La un eveniment desfasurat saptamana trecuta, luni, la Londra, Catherine Williams, chief data scientist AppNexus, a scapat porumbelul spunand ca 65% din afisarile tranzactionate prin platforma sunt fraudulente dar ca au luat masuri pentru a corecta aceasta situatie. Ulterior, probabil vazand reactiile industriei, AppNexus a nuantat afirmatia spunand ca de fapt 65% din tranzactii, nu din afisari, sunt fraudulente. Oricum ar fi, din afisari sau din tranzactii, 65% e un procent foarte mare. Acest „scandal” nu ajuta industria mai ales ca vine „la pachet” cu lansarea iOS 9.0 care permite, pentru prima oara, pe iPhone/iPad, blocarea reclamelor. In SUA dezbaterile pro/contra adblockere au atins apogeul in ultimele zile, mai multe publicatii apeland la masuri prin care contentul este blocat celor ce folosesc solutii de tip adblocker. #atsl15 Appnexus on centre stage talking about volume dropping 65% due to anti fraud steps…Why? @RubiconProject did this years ago!! 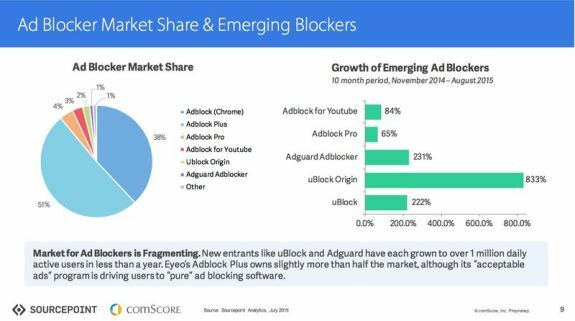 so ad tech reports 55% of advertiser $ go to ad tech (IAB). Now largest indep ad tech company reports 65% of inventory is fraud (AppNexus). Marco Bertozzi, global vice president of clients at Publicis-owned VivaKi, said it was “admirable” that AppNexus has tightened its controls on ad fraud, but it was rather late to do so. Wayne Blodwell, head of programmatic at Dentus Aegis-owned iProspect, agreed that it has taken a long time for the company to address the issue. “It’s great that a seller like AppNexus is investing time and technology into cleaning up their marketplace for buyers. However, could this have happened sooner? Definitely. Do other sellers need to follow suit? Absolutely,” he said. Titlul preluat de aici (original – Yoda: „Begun the Clone War has”), imaginea de aici. Still don't understand why the answer to sites with invasive ads is not to simply not visit the site.